Instagram is working on testing a standalone app for Direct Message. Instagram has been experimenting with new features for a while. The app allows you to create and share stories, has creative tools like Boomerang, also provides access to its unique filters. Now it is working on the standalone app for Direct Messages. Looks like Instagram is trying to beat Snapchat at its own game. Snapchat Direct Message is a good way to communicate with friends and other folks on Snapchat. With Instagram testing its own Direct Message App, Snapchat might get a blow on that too. Wouldn’t it be great to have a standalone Direct Message App, to have heart-to-heart conversations? WHAT INSTAGRAM HAS TO SAY ABOUT IT AND WHEN IS IT COMING OUT? As of now, the app is available in Chile, Turkey, Italy, Israel, Portugal, and Uruguay. Very soon, the app will be launched everywhere else as well. Facebook has been experimenting with new things lately. Some of the examples of it are Messenger kids and Instagram’s Direct Message. Facebook’s Instant games will now get support for live streaming and videos chats. Last year, Facebook launched Instant Games in November. The feature allows you and friends play games through Messenger chat app. Instant Games was introduced to encourage people to spend more time on Messenger doing something else apart from chatting. 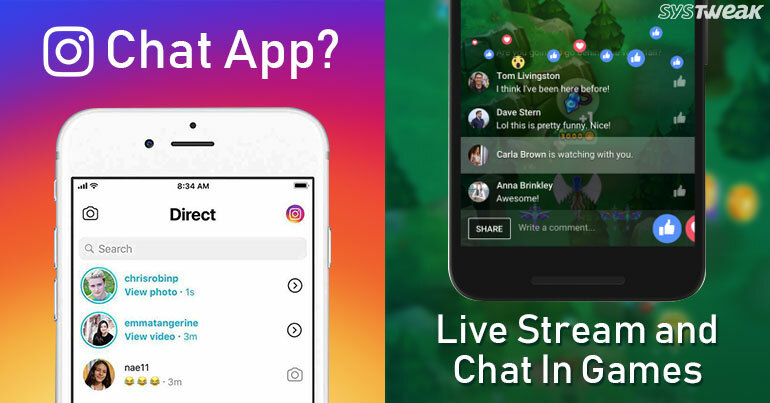 Now Facebook is adding new features such as support for video chat with gaming comprade, live streaming via Facebook Live. Live Streaming comes out today. With Live Streaming, Messenger users will be able to show off their gameplay to the Facebook Page. To do so, you need to tap on camera icon which is located at the top right-hand side of the screen while playing. After that, you can also add a description that you want to get displayed beside the post. To start recording the gameplay, tap on “Start Live Video”. Once done, the saved recording will get saved to your profile. Soon, Facebook will test a feature which will enable users to video chat with gaming companions. The features are expected to make a debut sometime next year. It will first appear with Zynga’s Words With Friends. Given the indulgence of video chat every month via messenger, the feature is expected to get a good response. All these features will give competition to popular apps like Twitch, YouTube for live streaming and hangouts and Fam for video chats. FACEBOOK TRYING TO RECLAIM THE SOCIAL GAMING THRONE? It seems Facebook is trying to reclaim the dominance in social gaming like before.Before it shifted to mobile, Facebook was great at social gaming around 2008. The company earned quarter-billion dollars per quarter on its 30% tax on in-game purchases. However, with its mobile app, it got faded as people spent most of the time playing native games on their iOS and Android. Now, first Instant Games and to mark its one year anniversary, it has announced new features to make sure users engage in it more and more. WHAT GAMES ARE INCLUDED IN INSTANT GAMES? Instant Games launched with 20 games like Pac-Man, Words with Friends Frenzy, Space Invaders and more. With time, the number increased and reached to 70 games. Soon, it will be adding some other popular games like Angry Birds, Disney Tsum Tsum, Sonic Jump and more.